The bookshop around the corner: Who's afraid of France? Of all the strange things to be afraid of, one of my fears is of being alone in Paris. Not of the loneliness, I'm perfectly happy on my own (and have visited numerous other places by myself), but until two weeks ago this particular city was up there with haunted houses and dark alleyways. However, like the dark alleyways, there was good reason for my fear – the awareness of my own ignorance. Visiting Paris I had no idea what I'd be encountering and were I to get into difficulty I had no way of getting out of it. Because despite years of French lessons my spoken French is about as good as the average person's spoken Latin. And because I really should know better I'm ashamed, nervous, and generally terrified of being yelled at by an angry Frenchman who's sick of seeing his language murdered by yet another ignorant tourist. Then I got talking to a bookshop. And spent the next six months or so failing to pluck up the courage to take a trip to Paris. Thankfully, I have some very good friends, one of whom kindly came to my rescue with the suggestion we both pick an activity* to do and head off for a few days' escape. I was so stunned by the possibility of actually visiting the bookshop that, believe it or not, I dithered over agreeing to the trip. Then sense, and the reassurance I would be in the company of a trusted, seasoned traveller (to whom I'm eternally grateful), won out and before I knew it we were on the Eurostar. Berkeley Books of Paris first caught my attention the way most far off bookshops do, through Twitter. The bookseller's observations are entertaining and informative, and the occasional exchanged tweet meant it soon became a familiar part of my online readings, so earning a place on the increasingly long bookshops I want to meet list – it may not be the most famous bookshop in the city, but there's a lot to be said for a friendly hello from a stranger. My visit began with a walk through the Opera region. Not an area I know much about, I soon discovered this was something like the Paris equivalent of Charing Cross Road and enjoyed nosing in the windows we passed. Then, as we drew closer to the bookshop, I spotted The Inevitable, a gorgeous neighbourhood cat who would've been my first ever bookshop cat met if I'd arrived just five minutes earlier. As it was she'd already decided to resume her exploring and miaowed her hellos as she passed. By this point I was getting quite excited. Then came the bookshop itself. The light blue front makes Berkeley Books easy to spot once you've found the right street, opening into a warm, welcoming secondhand bookshop. An average-sized space, it was just the right size to appeal to my browsing needs without intruding too much on the inevitable tourist trail. Walls of bookcases give the feel of a personal library, with the company of other customers to remind you you're really in a public place. One wall advertises 'literature', while further back I found shelves labelled 'fiction', it was a decision I struggled to understand until it was pointed out the latter is actually stocked with pocket books, with the shelves built to fit that specific size. I loved this unexpected organisational choice. 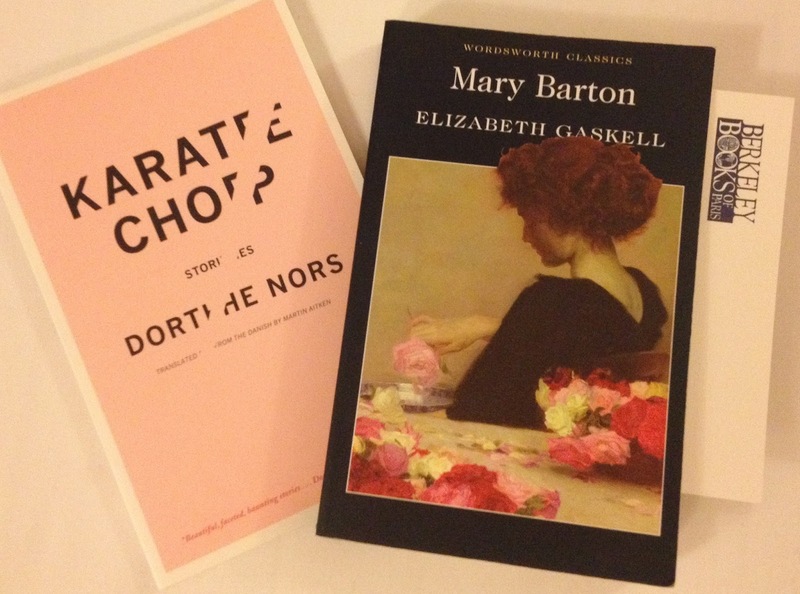 As for our purchases: I picked Mary Barton by Elizabeth Gaskell, while my friend chose Karate Chop by Dorthe Nors. Of course, I was equally engrossed by the rest of the broad-ranging stock, but it was the realisation I was in a safe haven that hit me the most. Yes, I'd been carefully guided through Paris by a very considerate friend, but for the duration of my visit to Berkeley Books I realised I was no longer afraid. 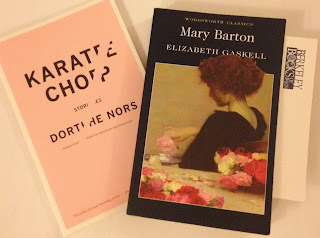 I was surrounded by books I could understand; bookshopping customers who were surely more interested in their surroundings than my inability to speak their language; and there at the counter was a bookseller, my as yet unmet friend in a foreign land. I went over and said hello. As you'd expect, the bookseller – an American in Paris – was as lovely as ever, chatting about anything and everything (including other local bookshop recommendations) and generally putting me at ease. Everything about Berkeley Books of Paris made me feel at home in a foreign city, helping prove I'd been wrong to be scared and right to make the journey. This time I travelled to the bookshop with a friend, next time I'll make the trip alone – to visit a friend. *The friend chose football. Go Paris Saint-Germain! lovely article which holpefully will draw many people to this excellent bookshop! "And because I really should know better I'm ashamed, nervous, and generally terrified of being yelled at by an angry Frenchman who's sick of seeing his language murdered by yet another ignorant tourist." Why would you think that? Have you heard us speak English? We don't have lessons to give in terms of speaking other languages. Thank you Emma. You all speak English a million times better than my terrible French so I appreciate your kindness. Having just taken a quick look at your blog I can confirm this is the case for your use of the language anyway (I particularly love your EU book tour). Although I will admit that while my French is still terrible my fear of your country has gone: no one told me off when I did attempt to speak and everyone (especially Berkeley Books) was so kind and friendly that I can't wait to return.